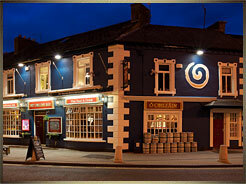 The bar is renowned for gatherings of Munster rugby fans to cheer their team on against the top teams in Europe. With several large flat screen televisions with surround sound you will miss none of the action. We have satelite television installed so you can watch all international soccer, rugby and more as well as taking in all inter-county hurling and football as well as all the top golf tournaments from around the world.